It's a golden age for lovers of strange fried food concoctions. Fast food chain Jack in the Box is the latest to this party with its new desert option, the Bacon Shake, the Eater reports. 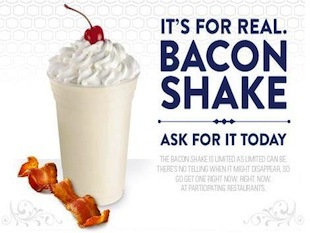 Contrary to what bacon lovers might be hoping, the shake isn't actually made with real bacon, SFist found. Jack in the Box describes the Bacon Shake as combining "real vanilla ice cream, bacon flavored syrup, whipped topping and a maraschino cherry." Specifically, one astute consumer at the blog GrubGrade says the flavoring is Torani bacon flavored syrup, which you can order yourself if you want to make Bacon Shakes at home. As it turns out, restaurant chain Denny's was ahead of the curve on the bacon-and-ice cream fad. And they even included real bacon in their Maple Bacon Sundae. To their credit, Jack in the Box didn't rest on their laurels with the Bacon Shake. They've launched an ad campaign, "Marry Bacon" that is exactly what it sounds like. There's not much there other than some moderately amusing videos, but the golden nugget is this Bacon tuxedo, which you can buy for under $20. If that's too steep, you can go with the "I Love You More Than Bacon" Valentine's Day card or the primal allure of Bacon cologne. There are even competing versions of bacon-flavored beer, for those so inclined. Rogue Ales offers the Bacon Maple Ale. The beer lists "Applewood-Smoked Bacon" among its ingredients.